Some of these ideas are taken from a new video app called Videolicious, which is both a video and video editor application for the iPhone. See their website for more information. If you have never used the front-facing camera before, you might not realize that it can be used for both still shots and video recordings. When you want to turn the camera onto yourself, simply click the camera icon in the top-right frame of the screen. 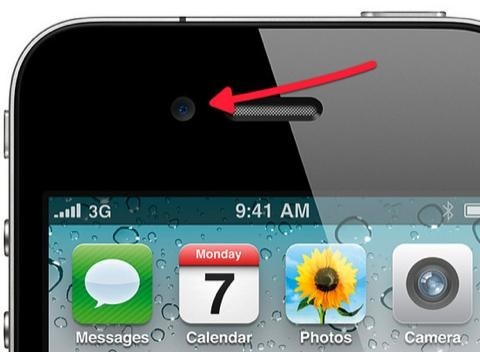 Secondly, if you're taking a photo or recording yourself in camera mode (not FaceTime mode), be sure to look at that the camera viewfinder itself and not directly at yourself into the retina display. If you look at yourself in the display, your eyes will not be looking directly at the camera. The front-facing camera is great for self-portraits. If you're the photographer who is typically behind the camera, then the iPhone 4 makes it easy for you to be in the picture. 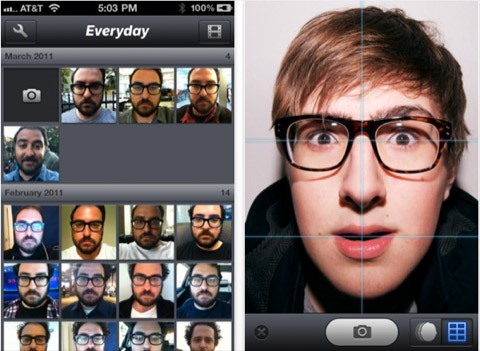 There's even an app called Everyday—specifically designed for taking self-portraits. 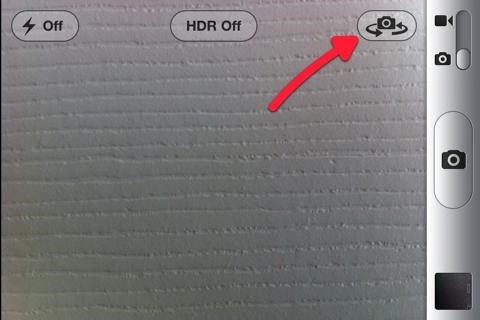 And many other iPhone camera apps include the front-facing feature as well. Typically when we attend networking meetings or want to thank someone for something special they did for you, instead of sending the traditional greeting or thank you card, it might be a good idea to shoot a quick "Video Thank You Note" that last no longer than 15-30 seconds. 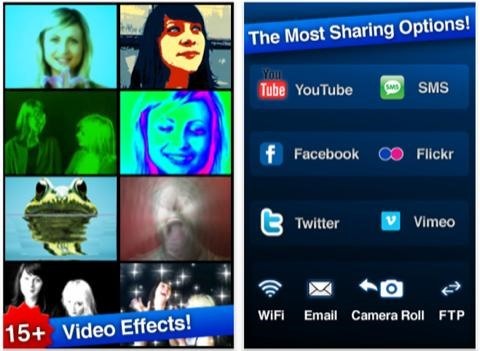 A short video can easily be emailed from within the iPhone and nearly all recipients whom use computers that support the iPhone video formats, including MPEG-4 and H.264. Many IM messaging services also support video messages. Similar to a video thank you note, you can use the front-facing camera and the Videolicious app to create a Video Resumé for long distance scenarios. Your resumé could include you talking to directly to your viewers, as well as cutaway shots of samples of your work. Kids love seeing themselves on camera. Sure, it's great when you snap the photos and shoot the video, but in most cases it's safe and fun to let kids hold the iPhone camera and see themselves as they snap a photo or record their own video. The front-facing camera can be very useful as a shopping tool for when you're trying to select clothing, eye glasses, hats, or make-up items you're choosing for yourself. You can look back through the shots of the various styles of eye glasses you tried on to see which looks best. You can also snap a "reminder shot" of a tag/label for looking up later online—for a sale, or different size. You can use your front-facing camera to keep a personal video diary and/or to post directly on your YouTube, Facebook, Flickr, Twitter, or Vimeo account. While the iPhone 4 supports uploading videos to YouTube and MobileMe, the app iVideoCamera supports uploading to all the previously mentioned networking sites. Many of us are very self-conscious about speaking in front of a video camera or large audience. The front-facing camera might be useful a tool for practicing and recording your presentation on the iPhone, and then watching it for areas where you would like to improve. Again, you could use Videolicious to create a short video of an item you're wanting to sell. The recording can start with you talking directly to your viewers, then include cutaway shots of the product you're selling. Videolicious videos can be up to 50 seconds, which is typically plenty of time for a short video. But if you need something longer, simply use the Apple's iMovie app for the iPhone or the iPad 2. When you attend an exciting or informative event, use the front-facing camera and Videoliciuos to capture yourself talking about the event, with cutaway shots of the parts of the event that you took prior to your narration of it. Use the front-facing camera to send a quick email message. You know how slow and difficult it can be to type out messages on the iPhone, and sometimes what you have to say could be said a lot easier in a video than in a long convoluted written email. Any other ideas? Please post below. Everyday is a really cool app. Another note to that (I don't know if you included it here) is that after a few moths of taking self portraits you can play it back in the video speed of your choice. Pretty sweet!